Victoria station is major portal to the sights of London so many of which are free, at least to look at, like London Eye. Our fourth tour takes us to Portcullis House, opposite Big Ben, accessed by walking or taking a bus down Victoria Street to Westminster underground station beneath it. Accommodating MPs this building is named after the chained portcullis on Parliament letterheads. It’s prominent chimneys draw air through the building by natural convection. You can visit Portcullis House to attend public committees after a security check. The walk views Big Ben and the statue of Boadicea crossing Westminster Bridge to London Eye returning across a Golden Jubilee Bridge to view Joseph Bazalgette’s memorial, one of the famous Lion’s heads, William Tyndale’s statue and the RAF memorial returning from there to Victoria station. From Westminster underground station under Portcullis House you can’t miss the UK’s most popular sight, Pugin’s 315 foot clock tower completed 1859 and renamed 2012 after the Queen as Elizabeth Tower. ‘Big Ben’ refers to the whole in popular speech but strictly to the 14 ton striking bell famous across the world. The restoration due for completion 2021 will serve public access to the bell chamber by providing a lift. The bell’s nickname refers either to its installer Benjamin Hall or boxing heavyweight champion Benjamin Caunt. During the renovation Big Ben is silent save to mark New Year, Remembrance Sunday and extraordinary national events. From Portcullis House cross Victoria Embankment to Westminster Bridge. Though leading to the south bank this runs due east on account of the bend in the Thames. On the west end of the Bridge, base obscured by a souvenir kiosk, is the controversial statue of Boadicea or Boudicca, Queen of the Iceni who destroyed Roman London 60-61AD. Thorneycroft’s splendid statue (1902) was commissioned at the height of the British Empire with Cowper’s triumphant lines on the side: ‘Regions Caesar never knew thy posterity shall sway’. These lines about Boadicea express the imperial aspirations associated with the reign of Queen Victoria. Cross Westminster Bridge and turn left at the South Bank Lion to walk along the Thames embankment to London Eye. It’s so called because its the largest observation wheel in the world from which you can see very many sights of London. At the top you’re 135 metres above ground and on a clear day can see features up to 25 kilometres away. Built 1999 its a feature of the capital associated with the opening of the Third Millennium. Hosting a splendid firework display its a London feature associated annually with Big Ben in pictures passed round the world of the UK’s welcome of New Year. Continue under the London Eye and return to Victoria Embankment across one of the Golden Jubilee bridges enjoying the river views and turn left along the footpath. Rather overshadowed by the Jubilee bridges stands the memorial to an engineer who saved thousands of lives by ‘placing the river in chains’ (flumini vincula posuit). Embankment engineer Sir Joseph Bazalgette (1819-1891) narrowed the Thames here to make space for a sewer running straight to the sea and an underground railway. In 1858 Parliament nearby suffered ‘The Great Stink’ halting proceedings which led to funding this work and a radical reduction in cholera and infant mortality. Continue from the Bazalgette memorial to the Tattershall Castle boat restaurant. With the steward’ s permission you can part ascend the gangway and look down at one of the line of carved copper lion’s heads Joseph Bazalgette installed as part of his creation of the Embankment sewer and railway. As well as providing mooring rings for boats these fierce figures keep watch by popular superstition over the Thames water level. As a folk poem expresses it: When the lions drink, London will sink. When it's up to their manes, we’ll go down the drains. When the water is sucked, you can be sure we’re all in trouble. Since the 1980s the lions’ heads have had regular washing. Cross Victoria Embankment into Whitehall Gardens and turn left. At the Westminster end of the Gardens there is an impressive bronze statue of bible scholar and Reformation martyr William Tyndale (1484-1536) in doctor's robes with bible and printing press. His criticism of Henry VIII’s marriage to Anne Boleyn incurred the King’s wrath as did his popularisation of the Bible through his English translation that remains the basis of the King James Bible (1611). As the plinth records: The last words of William Tyndale were "Lord! Open the King of England's eyes". Within a year afterwards, a bible was placed in every parish church by the King's command. 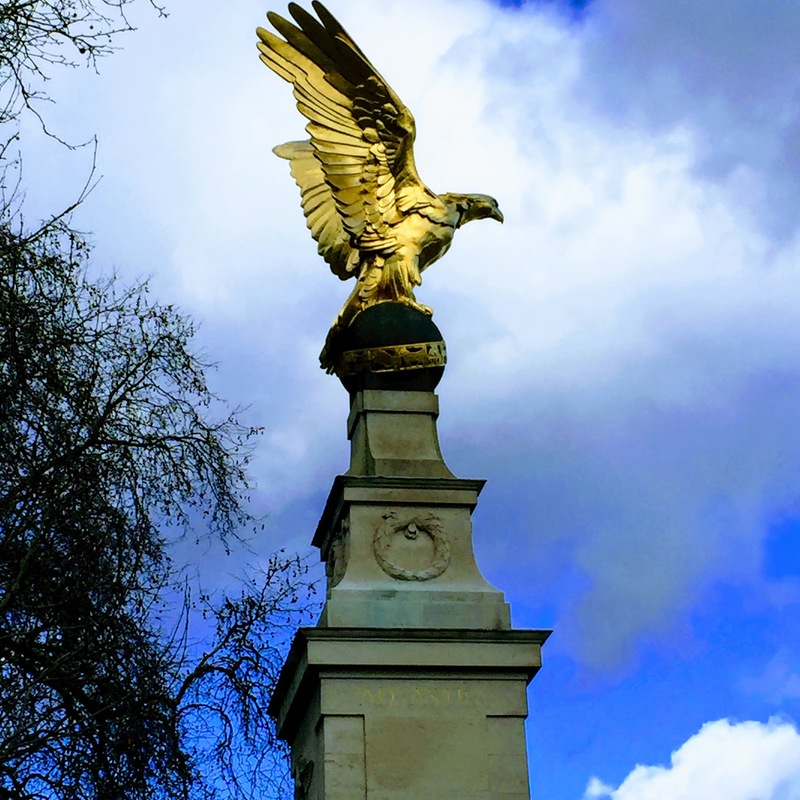 Continue along the Embankment towards Westminster arriving at the splendid RAF memorial (1923) surmounted by a giant golden eagle. Supplemented by the Battle of Britain memorial further along Embankment this commemorates Royal Air Force casualties from World War One and subsequent conflicts. The eagle perched on a globe is facing towards France. The RAF motto in gold underneath per ardua ad astra translates through struggle to the stars. It is complemented by a bible verse from Exodus 19: I bare you on eagles wings and brought you unto myself. Continue to Portcullis House and return to Victoria Station.